"But I race everywhere to make the best possible result. Journalists are the ones who claim that the Tour de France is my only goal," Van den Broeck told Sporza. Constantly unfortunate Jurgen Van den Broeck crashed out of the Tirreno-Adriatico, hurting exactly the same knee that was badly injured in an accident at the Tour de France again, but quickly returned to racing this time around with unspectacular yet solid performance in the Basque Country. Considered mainly as a grand tour contender, the 31-year old Belgian will ride in a support of his Lotto-Belisol team-mates in all Ardennes classics before turning all his attention to the Tour de France. Van den Broeck rode well as a part of a breakaway in the Brabantse Pijl yesterday, perfectly setting up his leader Tony Gallopin for the finale. "But I race everywhere to make the best possible result. The journalists are ones who claim that the Tour de France is my only goal," Van den Broeck told Sporza. In fact, the 31-year old Belgian has what it takes to shine in the hilly Ardennes classics, what was confirmed yesterday in the Brabantse Pijl, where he finished 18th despite riding in the support of Gallopin. 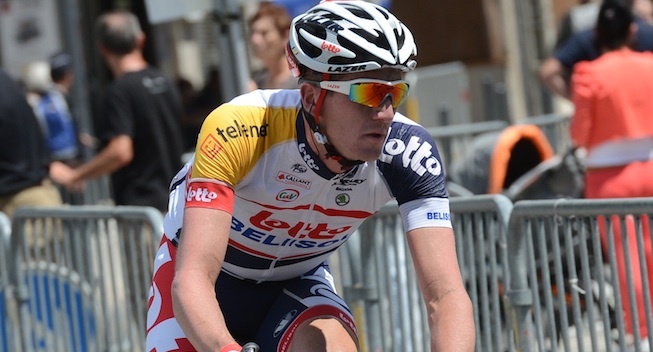 “Nothing ventured, nothing gained,” the Lotto-Belisol assessed yesterday’s breakaway attempt. Despite the crash he suffered at the Tirreno-Adriatico, Van den Broeck quickly regained confidence in his disposition and believes that he’s able to improve on his results from Ardennes classics despite riding in the support of the Lotto-Belisol leaders. “I will try to ride in the supporting role in the coming weeks, just as I started here in the Brabantse Pijl. I’ll try to continue in the same line through the Liege-Bastogne-Liege,” Van den Broeck said.